Prowling around the internet and discovered some more vintage movie posters. Now all I need is a way to buy some of these. 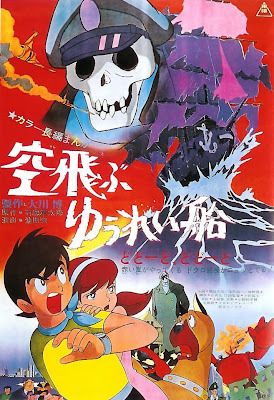 This is the poster for Toei Doga's 1969 movie, The Flying Ghost Ship. It's a somewhat obscure movie, and would very likely have been forgotten if not for the contributions of Reiko Okuyama, Yoichi Kotabe, and Hayao Miyazaki. By the end of the sixties, Toei had begun to branch off with a series of low-budget pictures, none of which are remembered fondly. While the main crew we know and love was busy creating Horus, Puss in Boots, Animal Treasure Island, and Ali Baba and the 40 Thieves, the glory days of the Toei studio were numbered. The Flying Ghost Ship is rare, even for Toei movies. I think the fansub comes from a Russian DVD. This was because the movie was a joint venture between Russia and Japan. This is why all the dialog is in Russian - or at least in the fansub copy we can all download and watch. Perhaps it's also a symbol of its quick, slapdash nature. 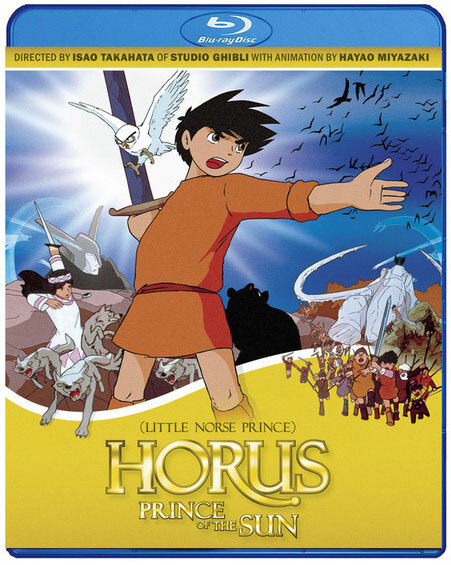 I'm sure more work was put into Horus on a good day than this entire movie's production. It's a fast, in-and-out affair. I hope that doesn't sound too harsh. I happen to like Flying Ghost Ship; it has the feel of a cheesy 1950's B-movie. You almost expect to find Tom Servo and Crow sneaking into the front row and making wisecracks. Those kind of movies are fun for me. Heck, if any anime deserved to be shown on Mystery Science Theatre 3000, it would be this one. 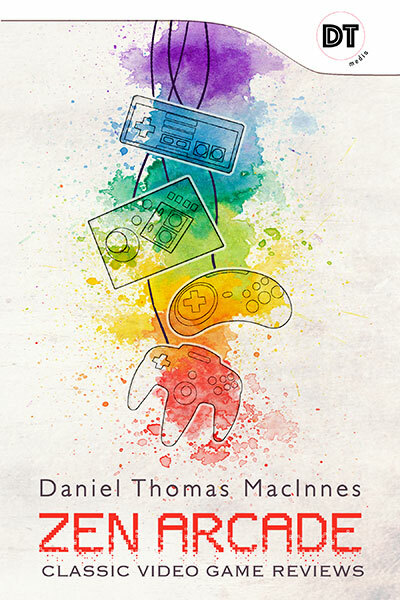 I really do like the poster, though. I'm a real fan of classic Japanese movie posters. There's something about that art style, the way they cram so many details onto the page. The dramatic poses, the highlights from key scenes, the mountains of text. Those were the days of real movie posters. Everything today is handled squarely by marketing, and it all looks so dull, so plastic. Yawn. Do yourself a favor and collect a few classic movie posters for your home. 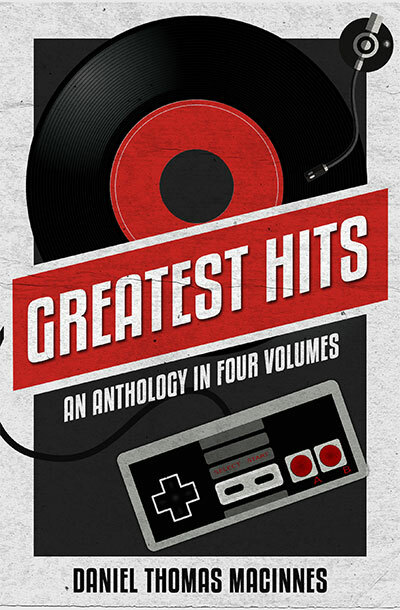 I guarantee it will brighten the mood and make you cooler to your friends. Back to Flying Ghost Ship. This is a short picture, only an hour, and yet it manages to cram three different storylines into its length. First, there is, um, ahem....alright, it's a cheesy Scooby Doo knockoff. See? They even have the same kind of dog. But this one doesn't talk or get baked on Scooby Snacks (now legal for medicinal uses). Which means this dog is really lame. But we do get a haunted house and a pirate ghost. From that, we move onto a larger conspiracy involving the Ghost Ship and a giant robot attacking the city. Yep, it's yet another giant monster stomping Tokyo. 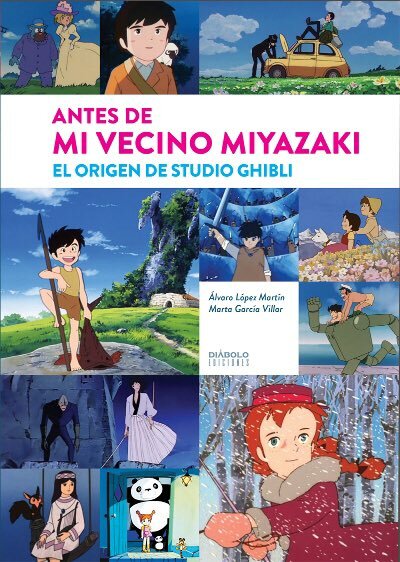 Ghibli Freaks will sit up and pay attention, though. This monster robot attack was key animated by Hayao Miyazaki. And, predictably enough, it's the best scene in the movie. 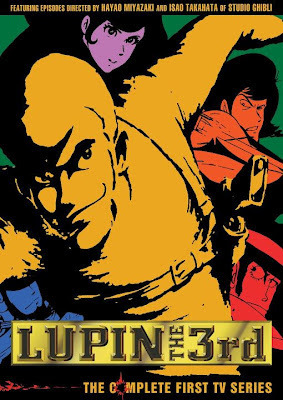 The shots of tanks rumbling through a crowded downtown would be riffed, years later, in the Lupin III Series Two finale, Farewell, Beloved Lupin. There are also a couple more Miyazaki riffs, which both appeared later in Future Boy Conan. One would be the uniformed guards for the evil corporation, and the other would be the pirate "ghost," revealed to be....ah, that would be spoiling things. C'mon, you can download this and watch for yourself. Shouldn't take you any time at all. 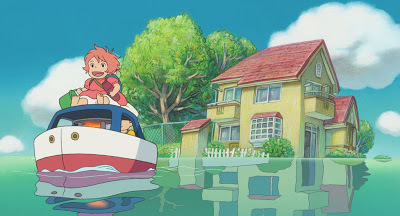 Somehow, the movie ends with the hero and a young scientist girl in a submarine, diving towards a secret ocean base where a giant sea monster plots to destroy Japan. Oh, didn't I tell you? These giant crabs suddenly appear out of nowhere and start smashing things. Hah! Giant monsters are Japan's answer to the Death Star. If any movie gets stuck, here's your cheap plot escape - monster attack! There's one more plot thread that really struck me, because it's a near-perfect copy to the "Slurm" episode of Futurama. That's the one where an immensely popular soft drink is, in fact, alien goo. And the whole corporate scheme is just a scam to take over the world. Hmm....yeah, somebody on the Futurama staff has most likely seen this movie. I wonder if he confessed where the original idea came from? It's not likely the plaigerism would be called out. Flying Ghost Ship, after all, isn't even available on DVD in Japan. A couple more notes about Flying Ghost Ship. There was another riff in this movie, one that I've mentioned before. It's a deathbed confession scene that quotes Horus, and was used yet again in Conan in 1978. 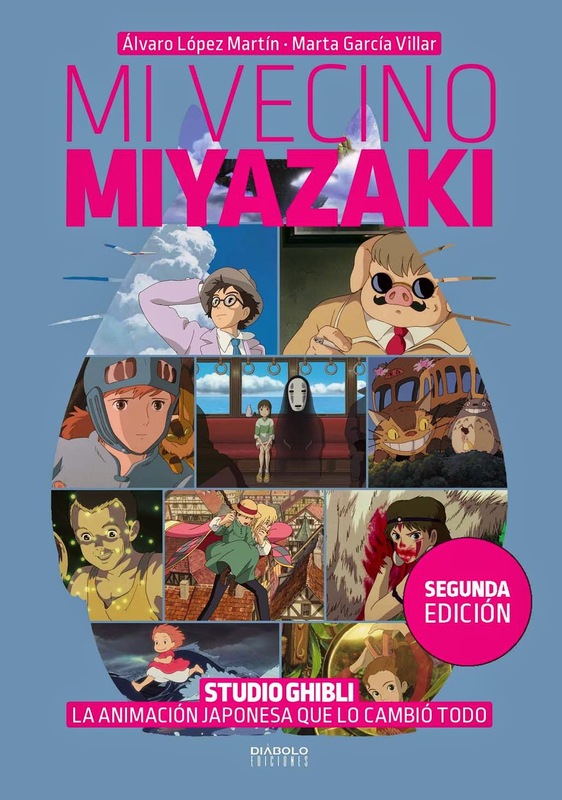 Miyazaki certainly took a lot from this movie when he was making Conan. Perhaps he just really liked those scenes he worked on, and didn't want them to wallow in obscurity. 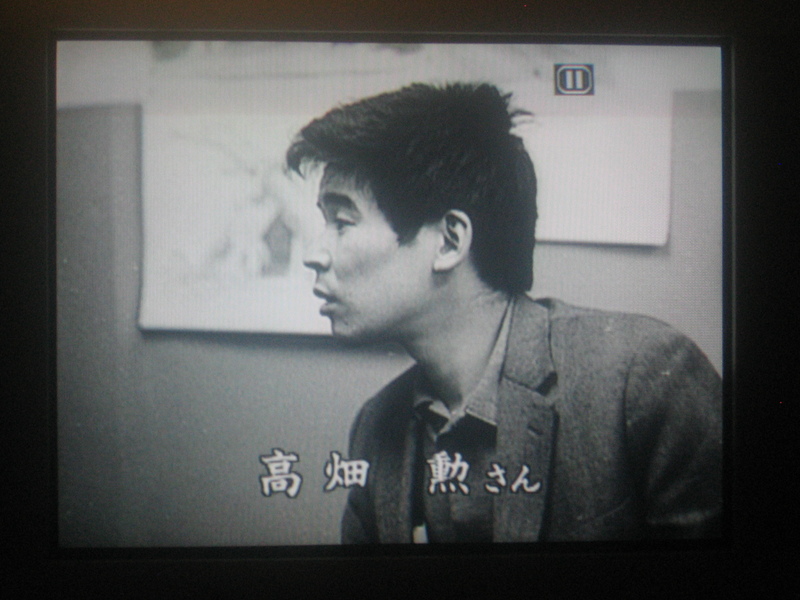 The second thing I wanted to point out was that this film was Yoichi Kotabe's first as Animation Director. As always, his faithful wife, Reiko Okuyama, was by his side, working just as hard and proving herself brilliant. In their future lay Heidi and Marco, and Kotabe would serve as Animation Director for Toei Doga's 1979 feature Dragon Boy Taro, a brilliant film and an echo of Toei's golden age. Flying Ghost Ship? Eh, not so much. A picture like this points towards Toei's decline, one that has proved more or less permenent. This movie was not what I expected it to be...well the first 1/3 was, but the last 2/3 were not, haha. I enjoyed it, similar to the way you did. This will never come close to making my all time favorites list, but a nice short little flick. 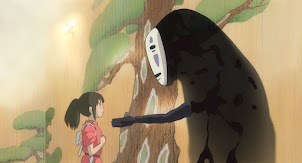 On the topic of borrowing from Anime films, I always wondered the same thing about Brad Bird's movie "The Iron Giant". As the robot in that film bears resemblance to the robots from Laputa:CitS. This is my favorite movie of all time guaranteed with triple your money back. Flying phantom ships captained by skull-faced ghosts that are really high-tech flying battleships battling evil robots controlled by a financial conspiracy ruled by a giant monster at the bottom of the sea served by giant talking crabs and soft drinks that dissolve people? Better than this you don't get. I paid cash money to have my laserdisc translated for a fansub back in the 90s, while at the same time a completely different outfit was fansubbing it themselves. I completely disagree that this film "points towards Toei's decline". What this picture does is smack Toei in the face and say "Quit trying to be the Asian Disney, you idiot." Toei spent the 60s producing fairytale pictures, some of which I agree are really incredible, but what would put Toei on the map as its own thing in the 1970s was action SF anime for the youth market, preferably with popular manga tie-ins from creators with impressive pedigrees (Go Nagai, Shotaro Ishinomori, Leiji Matsumoto). I do not see Toei's GALAXY EXPRESS films as a "decline", and that's just one example. Geoff: If you want an eyebrow-raiser in terms of borrowed giant robot imagery, check out the wonderful film Le Roi et L'Oiseau by Paul Grimault. It's a 1950s film that heavily influenced Miyazaki and Takahata. IIRC a perfunctory google search will turn up a full copy on Vimeo or a related service. The film is entirely in French, but dialogue is sparse and a fansub script is floating around out there if your google-fu is sufficient. I'm still seeking posters of Panda and the Magic Serpent (a fairly easy find, but I'm hoping for the insert poster which has a nicer design), The Littlest Warrior (easy but I want a better copy than the one I've seen floating around), and Adventures of Sindbad (can't find it at all, enormously frustrating, I may settle for the Japanese two-sheet which is titled in English). As for Flying Ghost Ship, I'm quite fond of this picture and don't see it as a signpost pointing towards Toei's decline. If anything, the company's decision to put aside lavish Disney-esque animation in favor of simpler fare is reflected more immediately in the previous year's Puss n' Boots, which is an amazing picture in spite of that (or, one might argue, because of that-- Sindbad looks great, but it's not a great film by any stretch). In fact, I'd hesitate to describe Toei's output in the 1970s as 'decline'-- they did indeed change their approach to animation, but it resulted in beloved classics and game-changers like Mazinger Z, Candy Candy, and Galaxy Express 999. I think it's a shame that their standalone features have fallen by the wayside, but I still enjoy new cartoons from them almost every year. 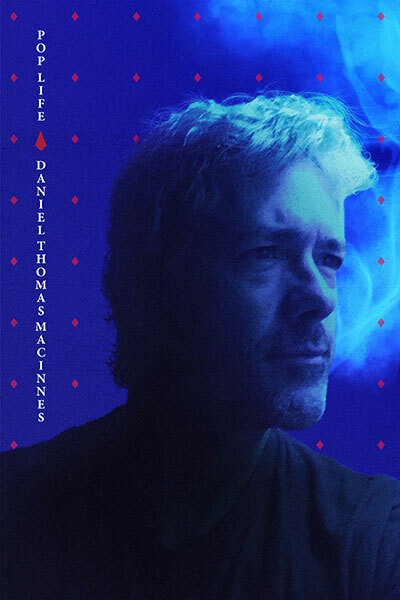 Daniel Thomas calls the dog in The Flying Ghost Ship a "cheesy Scooby Doo knockoff". According to the IMDB The Flying Ghost Ship opened on 5 May 1969 and Scooby Doo on 13 September 1969. So it must be the other way around. It's Scooby Doo who is the copy. These are very good insights. I'm pleasantly surprised to see that this movie has its fans, considering its virtual non-existence on the internet. In any case, I'm grateful for the fansub community for making Flying Ghost Ship available. I've been told a couple times now that Scooby Doo actually comes after this movie. How surreal is that?! I find it impossible to believe that these two productions, an ocean apart, both have Great Danes as comedy relief in the haunted house. And, yet, here we are. Stranger things have happened. These are good defenses of the movie. 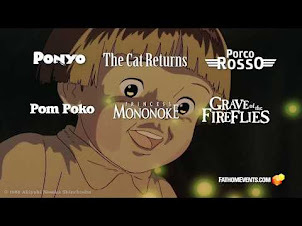 When I speak of "Toei's decline," I'm betraying my bias towards the lavish full-animation productions of the 1950s and 1960s, and that generation of young artists that included Miyazaki and Takahata. Guilty as charged. As in all things, it's a matter of taste. But with the exodus of the studio's top talent to A Pro in the early '70s meant the end of an era, one in which Toei was the cutting edge. That frontier would later be fulfilled by others, especially on television, with Lupin III, Space Battleship Yamoto, and Heidi. Now here's what I'd like to see from the Toei defenders: Make Your Case. Let's see some blogs and websites devoted to these films. Show us the histories and the players. Show us where to see the films and tv series. I've worked long and hard to present my own point-of-view. Now it's your turn.